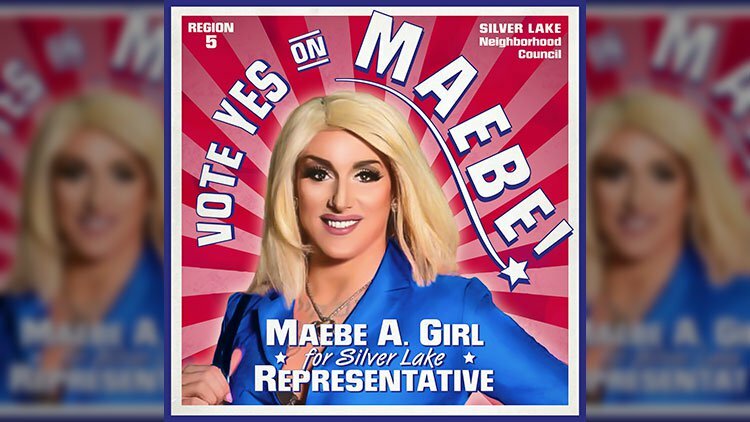 The drag performer won a spot on the Silver Lake Neighborhood Council in Los Angeles. Maebe A. Girl has made herstory. The drag queen has been elected to the Silver Lake Neighborhood Council in Los Angeles — making her the first drag performer to be voted into public office in California. Girl — who identifies as genderqueer and nonbinary and uses she/her and they/them pronouns — ran on a pro-LGBTQ platform. She vowed to advocate for the community in a statement sent to The Advocate, in which she said she was "thrilled" with her victory. "I’m honored to be the first drag queen elected official here in L.A. and, I believe, in all of California and the West Coast," Girl said. "I can’t wait to use my new platform to advance the LGBTQ community and provide visibility for those that have historically been kept in the shadows of society. I hope my successful run inspires others to do the same in their own communities." Girl follows in the footsteps of West Coast forebear José Sarria, a drag performer who ran for the San Francisco Board of Supervisors in 1961. Sarria lost but made history as the first openly gay candidate to vie for public office in the U.S.